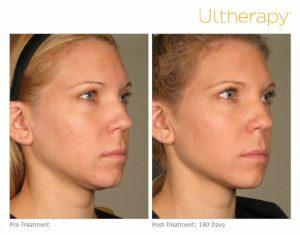 Ultherapy® is a non-invasive, FDA-cleared procedure used to lift the skin of the neck, under the chin, the eyebrow region, and the chest. 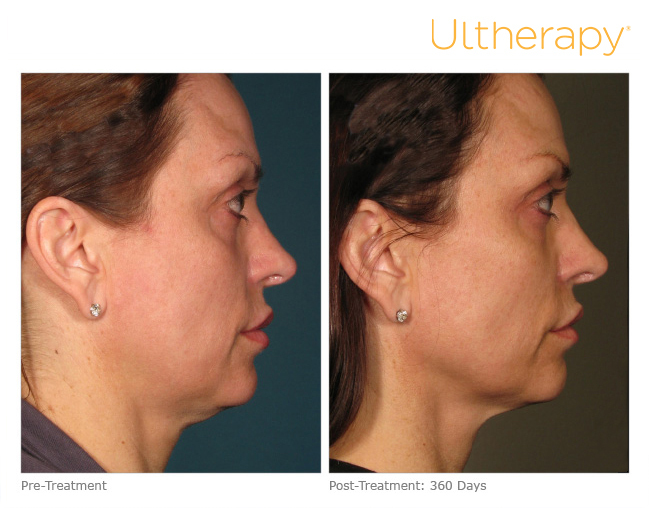 Using the safe and time-tested technology of ultrasound energy, this procedure is used to tighten the skin without surgery or downtime. By delivering the energy into the deeper layers of the skin, we can achieve our goal of collagen stimulation but yet not disrupt the surface of the skin. This ensures natural results, safety, and the convenience of no recovery time. Ultherapy® relies on ultrasound therapy to deliver its collagen-boosting treatment. It also incorporates traditional ultrasound imaging, which allows practitioners to see the layers of tissue they are treating, ensuring the treatment energy is delivered to where it will be most beneficial. Ultherapy® has been established as safe and effective in clinical studies and in more than 350,000 treatments worldwide.